I first saw the Four Agreements by Don Miguel Ruiz collecting dust on a shelf at my first job at the Yoga Garden. 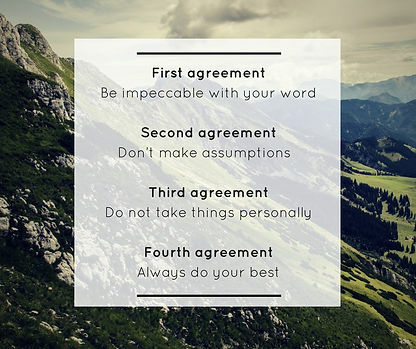 I vaguely knew what the actual four agreements were. What I did know was that this was one of the yoga books. I would not exactly say that there is a yogic literary canon, but most people accept this book as one of the common texts for yoga training. When I finally decided to pick this book up off of my own shelf, it collected dust for about a year. I was amazed at how fast I flew through this simple book finishing it in a miraculous day and a half period. I began applying the agreements to my life from the moment the words moved through me. 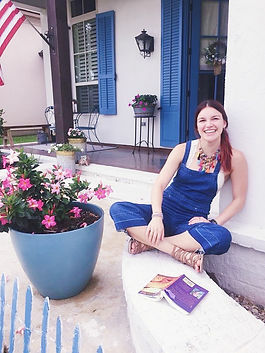 I saw it as a simple, secular self-help book before I journeyed through the pages. As a certain surprise, I gleaned the moments in the text that interpreted God without affiliation and discovered how inspiring it was to apply that interpretation to enhance my own. The agreements seemed to be God’s commandments for the self. These agreements are be impeccable with your word, don’t take anything personally, don’t make assumptions, and always do your best. I invite you to read the book through your own eyes, but here is why this book is on my list. First Agreement: Be impeccable with your word. What I say or write frequently comes out wrong. I am labeled as not having a filter which is pretty much true. I am naturally clumsy with words. I find it extremely hard to articulate words. Instead of being direct, I usually give the details before the purpose or the proof before the solution. I wrestled with this for a long time before I found a method for that fit each aspect of my life especially being a Catholic yoga teacher. This agreement in particular is so essential to yoga teaching, and teaching in general for that matter. Teaching is navigating minds and bodies with your own precious words without wasting the time and attention of that person or group. Yes, I may use my hands or my body to support a student, but my words give them the ability to gain confidence in themselves and trust in me. Rarely will I demonstrate a pose extensively because of that. The time that I am with that person is so valuable as well that I do not want to spend more time doing a pose that I already know how to do. It is the student’s turn, their opportunity. Words spoken by a Catholic can literally be either praising or condemning with little interpretation. Think of the extensive amount of ink that was put into the Catechism. Think of the revisions and the continual commentary on this gathered doctrine. The impeccability may seem far fetched but the Church survived years of religious, laity, and saints that sought to give Catholicism meaning. Their words were, as Ruiz says, “the gift[s] that comes directly from God” (Ruiz, 26). Our words as Catholics have the power to offer compassion or judgment and it is up to us to choose our words with impeccable compassion. Our own words are a force (Ruiz, 26). Second Agreement: Don’t take anything personally. Over analyzing ourselves is so easy. We are indefinitely accompanied by ourselves. Where we really go wrong is projecting what is happening internally outward. If someone is short with us, typically we may say, “what did I do now?” instead of “what is happening inside the other person?” We spend so much time with ourselves that we inherently become selfish. This selfishness is not negative rather it is a heightened awareness our self reality. By allowing someone else’s suffering make us suffer, we “agree to help each other suffer” (Ruiz, 57). Our response as Catholics should be outwardly compassionate instead of inwardly critical. In opposition, if I feel hurt by someone it may not be what they said that is truly hurting me. If you are hurt by someone else “it is not what [they are] saying that is hurting you; it is that you have wounds that [they touched] by what I have said. You are hurting yourself” (Ruiz, 51). When I first started practicing yoga, I took it very personally when teachers would assist me. I would wonder if I was doing it right and felt self-conscious. On the other side as a teacher, I ask for assists now because I need help to get the full effects of the stretch. The expression of those teachers were coming from a place of knowledge, experience, and most importantly compassion for me as their student. When a friend is going through hardships it may be hard to know what to do. Some people may just need someone to sit there with them; someone may need time alone. We often fall into the trap of assumption of maybe they need to be alone yet we do not ask what they actually need. Asking that question and picking up on that intuition may be difficult. Asking questions take a tremendous amount of courage that we may not have mustered. Yet, the Four Agreements remind us that “it is always better to ask questions than to make an assumption, because assumptions set us up for suffering” (Ruiz, 65). We then fall into the trap of “what if.” We could have prevented a major flaw if we only asked. Assumption is the absence of humility. When we assume, we imply that we know what we may be unsure of. Knowledge requires the humility to address our ignorance. Our knowledge goes beyond facts proceeding knowledge into the awareness of the people and the world around us. In the same way, we should not assume someone is who they actually are not. We thrust our accusations on someone without knowing them or even showing that we want to know them. Then we spend time with them, see who they really are, and realize they are so different. So naturally we think we can change them but “your love will not change anybody….real love is accepting other people the way they are without trying to change them. If we try to change them, this means we don’t really like them” (Ruiz, 70). Love does not assume, love accepts. This agreement fights the standards of today. We do not need to be “the best,” we need to be “our best.” My biggest challenge with the idea of being “the best” was always in school. After school when I would have a test my parents would ask me how I did on the test. My answer was always “bad.” Then they would follow up with “as long as you did your best that’s the only thing you can do.” And I, of course being melodramatic, would say, “but that’s not good enough! I need a good grade!” What I was really saying to myself was my best is not good enough and therefore I am not good enough. My best is all that I have and all that need to be who I am. I am still struggling with this and hopefully I’ll overcome this soon given that the path I want to take involves years of more school. We are meant to do our best at what we find our passion in. Passion is the blossom of our best selves. Passion ignites our lives. Our fullest life comes from that moment of joy and praise in doing what is the best for us. We are meant to honor God through this passion because He planted that gift on our hearts for us and for Him: “the best way to say, “I love you, God,” is to live your life doing your best. The best way to say, “Thank you, God,” is by letting go of the past and living in the present moment, right here and now” (Ruiz, 83). One of my favorite aspects of this book is the way God is spoken of. Ruiz did not necessary speak of God as a “Catholic God,” but all God is surpasses the label of any religion. He expresses this concept by saying, “God is life. God is life in action” (Ruiz, 83). Every moment of our life is the essence of God. In the same way, every movement of mind, body, and heart is an extension of God. We can be hesitant of this lack of control or we embrace it. Our life, our God is moving us: “don’t resist life passing through you, because that is God passing through you. Just your existence proves the existence of God” (Ruiz, 84). Our unity with God is everything, He is everything: “everything in existence is a manifestation of the one living being we call God. Everything is God” (Ruiz, xvii). Catholicism is God. Life is God. Action is God. Love is God. You have God in you.